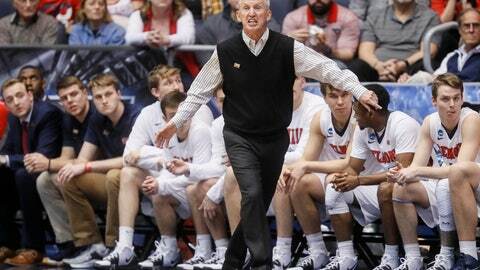 NASHVILLE, Tenn. (AP) — Rick Byrd, ranked 12th all-time among Division I head coaches with 805 career victories, is retiring after 33 years coaching the Belmont Bruins. Byrd announced his decision Monday. He led Belmont’s transition from an NAIA program to NCAA Division I where he led the Bruins to eight NCAA Tournaments in the last 14 years, including last month with the program’s first at-large berth. Byrd, who turns 66 on April 30, led Belmont to 17 conference championships with 10 regular season and seven tournament titles since 2006, and only Gonzaga and Kansas have won more in that span. Every player who completed his eligibility under Byrd graduated with only two transfers in the past 15 years. The Knoxville native started his career as head coach at Lincoln Memorial and Maryville College. Athletic director Scott Corley says a search for Byrd’s replacement will start immediately.